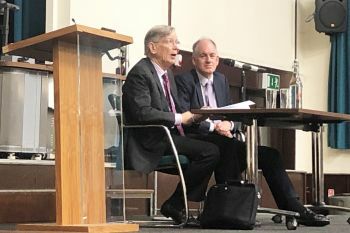 The UK Supreme Court Justice addresses the efficacy of legal provision, legal agreement and legal obligation in empowering countries to tackle the challenges arising from climate change. Justice of the UK Supreme Court Justice, Lord Carnwath of Notting Hill, gave the lecture, Climate Change and the Law, at City on 13th February. The second in The City Law School’s Constitutional Law Lecture Series, Lord Carnwath talked to a number of Law students and staff about the way in which legal provision, legal agreement and legal obligation empower and compel countries across the world to tackle the challenges posed by climate change. City Law School Dean, Professor Andrew Stockley, chaired the event. Lord Carnwath of Notting Hill, KT CVO, has been a Justice of the UK Supreme Court since April 2012, previously serving as Lord Justice of Appeal and Judge of the High Court. He practised at the Bar and was appointed QC in 1985. Lord Carnwath has a long-standing interest in environmental issues and is President of the UK Environmental Law Association.